Let your call stats come alive! 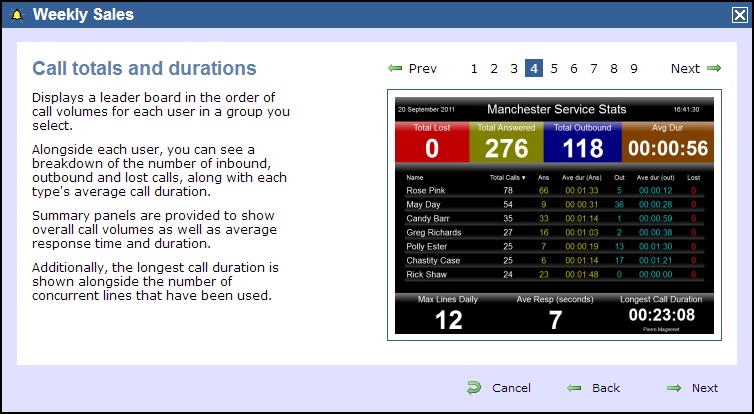 Display boards are customisable web pages that allow you to display up-to-the-second call information. You can custom design your own screens or use one of our standard templates to display call results visually for any site or team. Striking, informative and fully-customisable, these display boards are included free-of-charge and provide instant business intelligence, including call alarms. For a complete overview of how they work and what you can display on them, simply click on the video link above. What can I show on them? The display boards can comprise of one or more types of display panel. The type of panel used will normally determine the data shown e.g. Summary and Leaderboard panels are normally used for call data. Web panels and RSS panels are often used to incorporate external data. Just pick the panels you want to use, determine the size of each panel and customise the content to populate. By allowing users to create and customise their own combination of leader boards, news headlines or CRM information with additional summary panels, there is no limit to the permutations that can be achieved. How long do they take to create? You can create a display board in seconds using any one of a number of templates we supply as standard. All templates can be edited and changed to allow you to customise any board to your exact needs. TIM Enterprise does not place any limit on the number of display boards you are allowed. You can even set up more than one display board for any specific area of your organisation e.g. 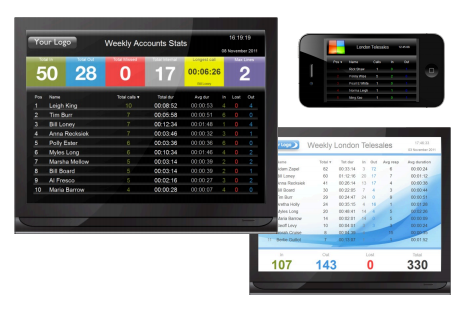 You may want two display boards on your London telesales team - one showing daily stats and one weekly stats. You may even want to combine the results in a single display board. There is NO cost for adding display boards in TIM Enterprise. You will however have to provide the physical screens required to display the information, if you do not want to access purely from your web browser. Where can I display them? You can display on any large plasma screen or view from any device that offers a standard web browser e.g. PC, laptop, mobile etc. How quickly are they updated? Call processing is lightning-fast so calls are displayed as soon as they’re finished. This immediate visibility of relevant call data combined with the ability to order results based on any criteria allows for effortless, effective management. So go ahead, get creative and see your teams' statistics right now! Your screen refresh rate will determine how often the screen updates.